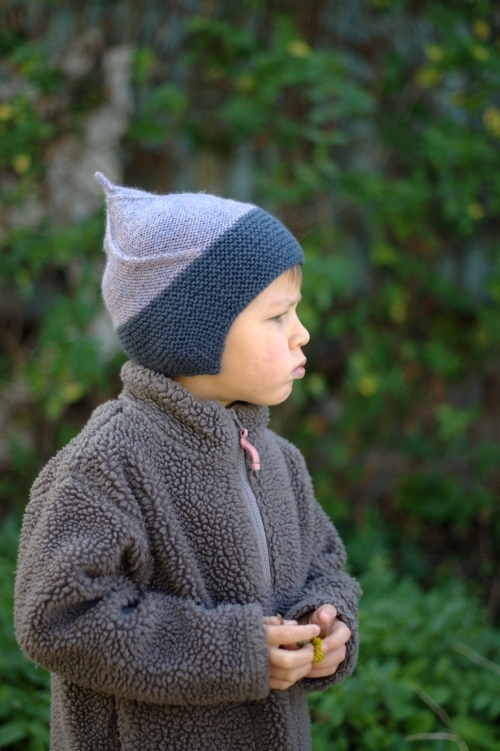 Indeed, Álfur, the uber cute pixie Hat, has been published today. And if you're a subscriber to the newsletter, you'll find a coupon code that will give you a discount when the newsletter goes out later today. The Hat is knit top down, and it doesn't take long to get into the swing of the pattern. It's pretty intuitive and knits up quickly. The brim here is knitted in a 2nd colour, though you could easily work it in the same as the body if you prefer. Likewise, if you don't fancy the earflaps simply leave them off! The beauty of earflaps on a top down Hat is that there's no awkward joining - just some painless casting off for the brim. And those earflaps are nice and snug and well fitting, too - perfect for keeping the chills out. Four sizes are included, from approximately 3mths through to small/average adult. Should you want a larger (or smaller) size then regrading with a slight change in yarn weight or needle size will do the trick just nicely. Although there's a cable twist pattern, I haven't included a chart as I normally would. There are 2 reasons for this: a) the cable twist is very simple, and following a chart could be more of a hindrance than a help and b) adding a chart would have added an extra page, and that would have made it a £3.00 pattern instead of the £2.50 it is now, which I felt was a better price for this one. Of all the Hats I've designed lately, this is probably my favourite. I know pixie Hats aren't everyone's bag yet this one worked itself so effortlessly; it knew what it wanted to be. It was instinctive and comforting to knit and design, and I hope those qualities carry over into the pattern for you. And it's perfect timing for it - what could be better than a little pixie Hat for your favourite little people for the holiday season! So there we have Álfur - enjoy! PS/ interested in it's name? If you Google 'Álfur' you'll find a few meanings, and in this case, it's Icelandic and Norwegian for Elf. The varying meanings to the word all have Norse/Scandinavian origins, and somehow they all link back to 'people of the forest' or 'elf'. Newer:As we head deeper into the season of madness..Older:Can you help me find some fabric?